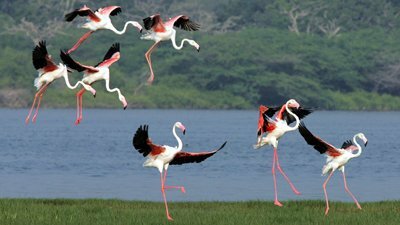 Rescued flamingos back in Kimberley - SABC News - Breaking news, special reports, world, business, sport coverage of all South African current events. Africa's news leader. Their original habitat could no longer sustain them due to decreasing levels of the dam's water sources. Scores of flamingos rescued earlier in 2019 are back in Kimberley in the Northern Cape. Hundreds of others were saved from Kamfers Dam and flown to Cape Town, Durban and Pretoria for rehabilitation. Their original habitat could no longer sustain them due to decreasing levels of the dam’s water sources. But now, it’s almost back to normal for this special breed. “The first batch arrived this morning about 8 o’clock. It was 51 flamingos from the national zoological gardens in Pretoria and the second batch, it’s just being offloaded, it’s arrived around 9:30 from uShaka Marine World in Durban,” says Wildlife Veterinarian, Katja Koeppel. The birds will soon be back to what’s been dubbed as one of only four sites in the world where flamingos breed in the country. And they want to ensure a healthy future with thorough inspections going forward. “So we’re checking them all out we’re putting a yellow band on the right legs so we can identify them from a distance, we measure their wing, we check their weights and we’re putting them in an enclosure,” added Koeppel. They’re expected to be released back to the dam under the care of the Society for the Prevention of Cruelty to Animals (SPCA) after two weeks. This entry was posted on 10 Apr 2019,09:09PM at 9:09 PM and is filed under Lifestyle. You can follow any responses to this entry through the RSS 2.0 feed. Both comments and pings are currently closed.